This past weekend we had a 5 day break to allow the students who do not have a student VISA to leave the country in order to re enter as tourists. Our family applied for VISAS when we arrived so we did not have to leave- instead we hopped a bus with another family and took a 3 hour tour to Manuel Antonio National Park. If you ever have opportunity to visit Costa Rica, this park is a must see. The rainforest meets the beautiful sand beach and wildlife is plentiful. 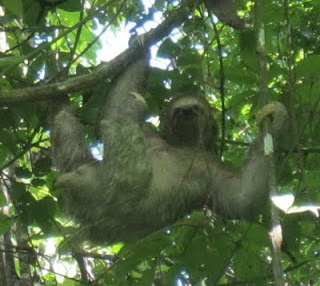 Our guide, Freddy had a spotting scope so we were able to see sloths and monkeys and even a toucan close up. He was also able to take photos through the scope - enjoy! Last day of school photos!